8 Half Inch DeWalt Miter Saws are quite popular among experienced woodworkers and novices alike. What makes them so popular? What are their main features? What are their major advantages and disadvantages? Let us take a look at the answers to these questions now.
.	Arbor size - 5/8"
The reviews written by professional woodworkers say that 8 Half Inch DeWalt miter saws are incredibly easy to operate. The reviews written by first timers, on the other hand, say that it takes some time to get used to the operating techniques. In my opinion, the degree of comfort or the degree of discomfort is based on how well you understand the instruction manual. A lot of first time users have mentioned that the horizontal handle accounts for improved ease of use. Especially, people who have switched from vertical handle to horizontal handle say that it is a very good feature. It is designed in such a way that you do not get any sort of wrist pain or wrist fatigue even after using these saws for a long time. The sliding mechanism in 8 Half Inch DeWalt miter saws, as expected, is very smooth. The motor is very powerful which kind of explains why these saws are called heavy duty saws. The quality of the build is good and has a very nice Italian touch to it. Some other reviews say that these saws are the only 8 ½" saws which can cut through 3-inch newel posts smoothly. This feature, apparently, makes these saws the best choice for people who are into stair building. The saw weighs in at 43 pounds. If you think it is too heavy to be carried around, you can get a good saw stand. Some people have the feeling that the blade that comes along with 8 Half Inch DeWalt Miter Saws is not good enough. The carbide tipped blade in these saws is only good for rough cuts and framing work. If you are doing finishing work, you should change this blade and get a good one - probably a 60-tooth one. Changing blades could also be a cumbersome process because of the blade guard, but you can get used to it quickly. Some of the reviewers have mentioned that there seems to be a problem with the bevel gauge as well. Apparently, when you tilt the blade to 45°, the gauge actually reads at 46°. They suspect it could be an engineering fault. Also, there are no work supports on the sides. The dust bag, as expected with miter saws, is not that good. So, the dust gets thrown everywhere. But I guess that is something you prepare yourself for when you get a miter saw. 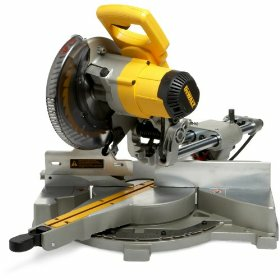 Notwithstanding the flaws mentioned here, 8 Half Inch DeWalt Miter Saws seem to be a good choice for anyone who is looking for a good single bevel sliding compound miter saw. Return From 8 Half Inch DeWalt Miter Saws Page to Home.